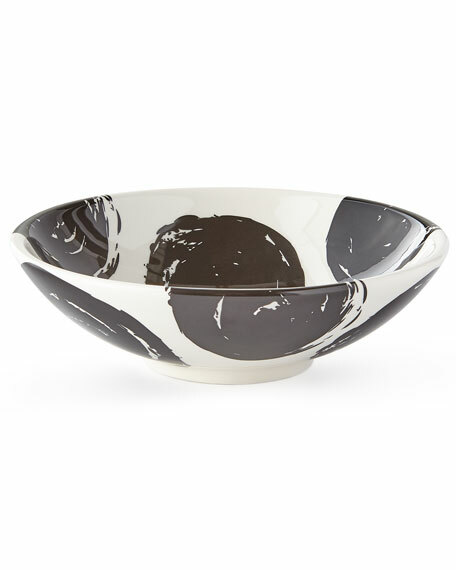 Breakfast bowl has hand-glazed, heavy-gauge steel underbody. 7.5"Dia. x 2.5"T. Hand-painted Courtly Check decoration. Rolled, scalloped edge. Dishwasher safe; hand washing recommended. Imported. Soup bowl with heavy-gauge, hand-glazed steel underbody rimmed in bronzed stainless steel. Hand-painted Courtly Check® design. Dishwasher safe; hand washing recommended. Holds 12 ounces; 9"Dia. Imported.